Aviary recently launched a really impressive streamlined image editor built entirely with open web technologies called Feather. They gave us a sneak peek of how it works before it launched, and we knew right away that it would be a perfect fit for Shopify. In fact, we were already integrated with Aviary to let you edit your shop’s images, but that involved a redirect to their more heavyweight full-screen image editor. Feather makes things even easier by putting the most commonly used tools into an inline editor so you can make quick changes without leaving Shopify at all. You’ll see the same edit link for each of your uploaded images, but now it will launch the new editor as a “lightbox” style popup. 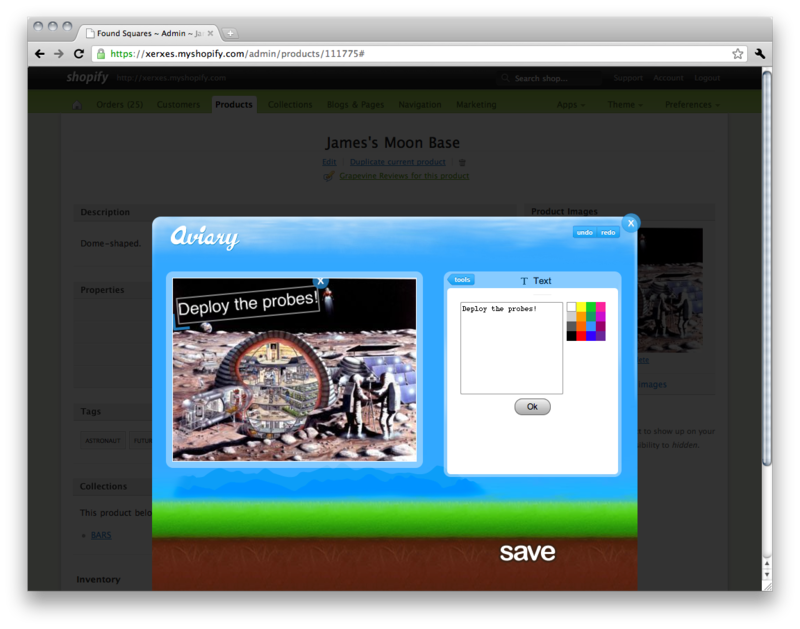 When you save the image in the editor, it updates Shopify directly. Awesome!